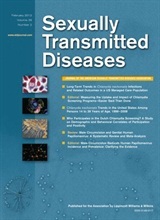 Sexually Transmitted Diseases publishes original, peer-reviewed articles on clinical, laboratory, immunologic, epidemiologic, sociologic, and historical topics pertaining to sexually transmitted diseases and related fields. Reports from the CDC and NIH provide up-to-the-minute information. A highly respected editorial board is composed of prominent scientists who are leaders in this rapidly changing field. Included in each issue are studies and developments from around the world. Subscribe to the journal by becoming an ASTDA member. Members – Activate your online subscription today and use all the journal features and functionality that the Sexually Transmitted Diseases website offers!